Light from the open shutters illuminates the Peacock Room. Today from 12–5:30 pm, take advantage of the last opportunity until 2017 to view the Peacock Room with its shutters open. Beginning January 4, 2016, the Freer Gallery will close for renovations so that we may better serve our visitors. We’ve been opening the shutters each month to highlight the chromatic complexity of the Peacock Room’s decoration. Once light pours in, the colors become richer and the gold shines. The effect makes you appreciate the work’s full title, Harmony in Blue and Gold: The Peacock Room. It is a dazzling moment that feels operatic in its power. No wonder Whistler often chose to title his works with musical references. 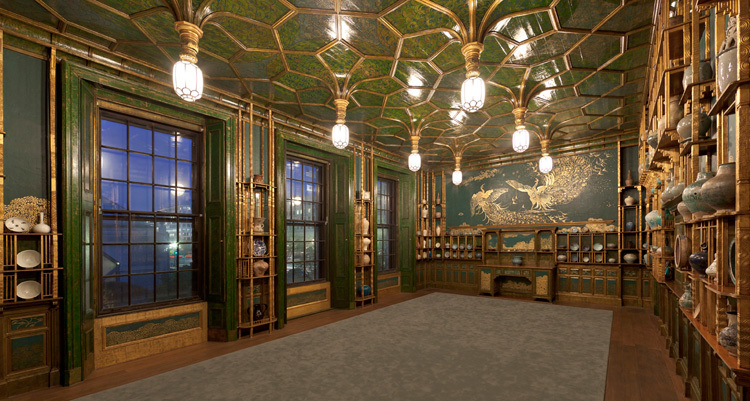 Viewing the Peacock Room in natural light is a true symphony for the eyes. And, with conservation in mind, a special filtering film has been applied to the windows to preserve the iconic room and protect the contents from fading. Remember: While the Freer is closed, you can still see the Peacock Room’s contemporary counterpart Filthy Lucre in the Sackler, which remains open. Plus, you can visit Whistler’s masterpiece anytime via our free Peacock Room app.